By Voice, I’m being reminded again how brilliant OCN’s noir-themed drama is. Voice was an exciting ride from start to finish, a true thriller story. I had been meaning to watch Voice since its airing time but I couldn’t do it due to my real life obligations and only finally finished it around last month. Starting from ep 1, it was heavy and suspense already. As the episode went on it became more gory. Like usual, OCN’s signature. Maybe due to the new restrictions made, many parts got blurred unlike OCN’s stuffs in the past. I really appreciate the effort of every cast –and of course the staffs. They gave their best in every scene, even the cameos too. Jang Hyuk. Hands down. The filming condition was harsh too. They filmed under snow in many episodes. Sometimes even under heavy snow rain. Jang Hyuk did a lot of running scenes too. It could take up 20 takes just for one running scene that only last like 5 seconds in the actual dramas. Do not forget that Jang Hyuk did a lot of fighting scenes too. Hands down, Jang Hyuk was the best. He also delivered an emotional acting every time his character (Mo Ji Hyuk) remembered his past wife. Lee Ha Na as Kang Center was a girl crush for me. At first she wasn’t very pleasing since she acted all cold and wore 1 expression only. But after the episode went on I started to think that she was the perfect fit for this role. I just liked how Kang Center was pictured as a strong, intelligent woman and Lee Ha Na brought that to life. The directing was superfab! Several episodes abused “shaky-camera technique” but other than that everything was smooth and great. The director knew how to make the atmosphere become more suspense and eerie THAN IT SHOULD. I also liked how crisp the shots were. Maybe because Kang Center had an ability of sharp hearing and the drama focused on that, I felt like drama was more detailed in sound department compared to other dramas. What can I say. Voice was just great from start to finish. Great character development, story development, detailed plot, detailed props. The dialogues were also rich. One scene that really stood out for me is from ep. 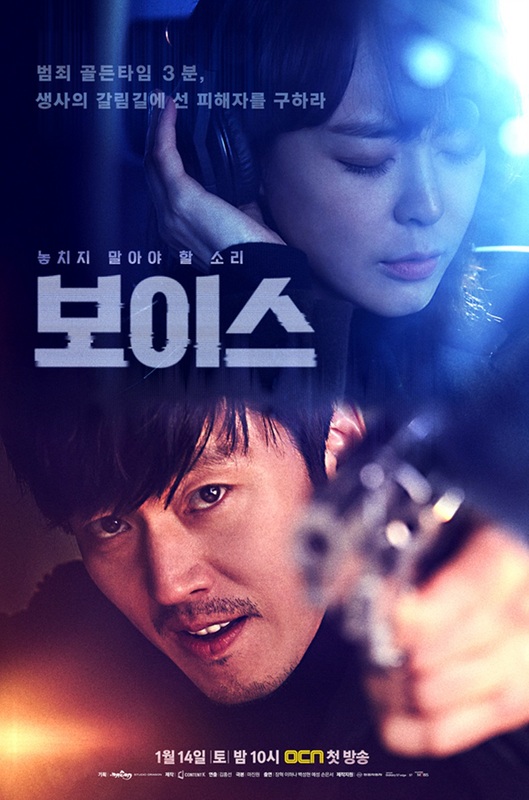 15 –the talk between Detective Moo and Dae Shik. With Detective Moo’s temper he actually could sit down and talked to Dae Shik calmly, stayed composed and reserved. Then Detective Moo said, “Ji Hye taught me this” as the BGM started playing. I lost it every single time at this very moment. After rising his voice Detective Moo then said in relatively low tone that his wife taught him to endure pains. This one scene is scene stealer for me. One of the most outstanding scenes out of the entire drama. Actually there is nothing much I can talk about. The drama was very well made, really lived up to OCN’s name. If you haven’t watch Voice, I urge you to do so soon. Voice gets a solid 10 out of 10 from me.